This past weekend was the Santa Clara Valley Quilt Association bi-annual quilt show. As a member, I was able to enter three quilts myself and my son was able to enter his quilt as well. I showed Candy Shoppe, Antioxidant Delight and Stellar Wind. And just in the nick of time, his quilt was ready to go as well. If you haven't been following along, our journey began in January. In my last post he had his quilt top pinned and ready to go. We discussed quilting options and decided he'd try echo quilting 1/4" on either side of the seams. As he started the first line it became clear that he was having trouble keeping the quilt straight, so we took a break from his quilting and sketched some possibilities on paper. He decided to go with just sewing the lines in "whatever direction." My son had done all the piecing work sitting on my lap at my sewing table. I worked the pedal as he steered the fabric, with some guidance from me. For the quilting we set my machine up (with the walking foot) at the kids table and he was able to work the pedal as he fed the quilt. After each line we discussed where to start and aim to finish the next line. As we got to the end, I made some recommendations about what areas had less quilting. He did about 3 lines of quilting each evening, supervised by me or Auntie Jenn. From a comment by Bo (on the Part 2 post) we decided to stitch in the outline of his hand. 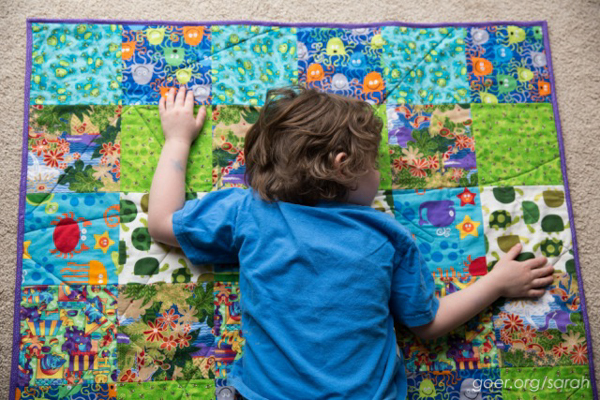 I think this will be a lovely reminder of how small he was when he made the quilt. For reference, the quilt blocks are 6-inch finished squares. I made and attached the binding for him to finish the quilt. I made a quilt by like laying out the quilt, I was sewing it and I finally came to quilting and I finished quilting it and I put it in the quilt show and it was at the Santa Clara Convention Center, so yeah. How did you decide on the name “Jungle of Animals”? Because it has lots of animals in it. Pretty good. 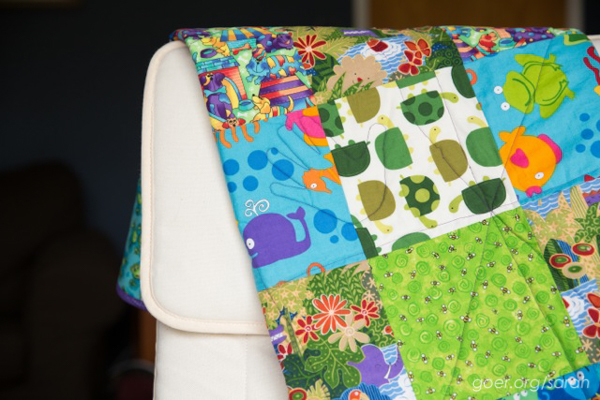 I really liked it because that it kind of made my life better because I never made a quilt before. That I got to do it almost all by myself. Quilting it cause I put pins in it and I sewed it whatever direction. So it kind of made my life start better. To not sew on yourself. And to keep the quilt flat while you’re sewing. Good job for making a quilt. Your quilt hung in the SCVQA quilt show this weekend. Can you tell me more about that? What are your plans for "Jungle of Animals" now that it is done? I will put it in my mom and dad’s room and I’m going to make my own special pillow and it's gonna be small so I can cuddle in my mom and dad’s room. A rainbow doll quilt for my sister’s babies for her birthday. She is 2 ½ and she has some dolls. I’m 4 ½ and yeah. I think they would like to know how I sewed it. I sewed it by laying it flat on the ground and my dad looked at it and he said “beautiful. Nice work.” Then we started sewing the squares into twos, then fours. Then we put it together. Then we quilted it. Then we put the binding on and we were done. So it only took a couple steps. 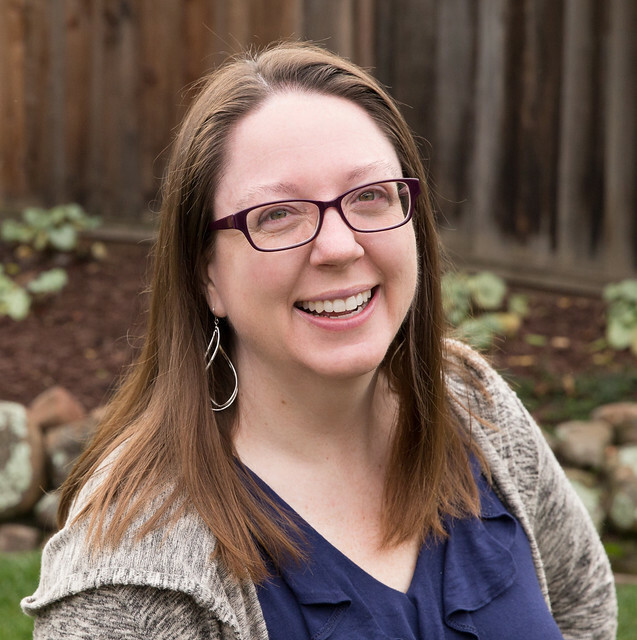 Photos by Jennifer McNeil Photography. Thanks Auntie Jenn! Helping him make his quilt is one of my finishes from my Q1 Finish Along Goal List. Linking up to the Q1 Finishes party at On the Windy Side. Posted in Quilting. 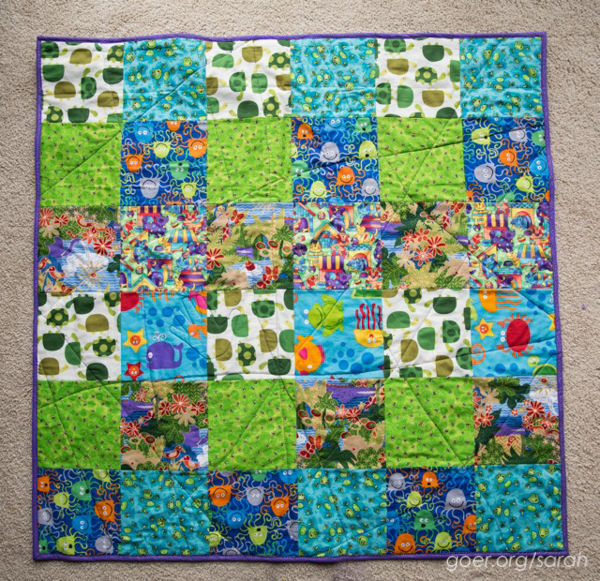 Tags: quilting with kids on March 16, 2015 by sarah. Great photos and darling interview!!! 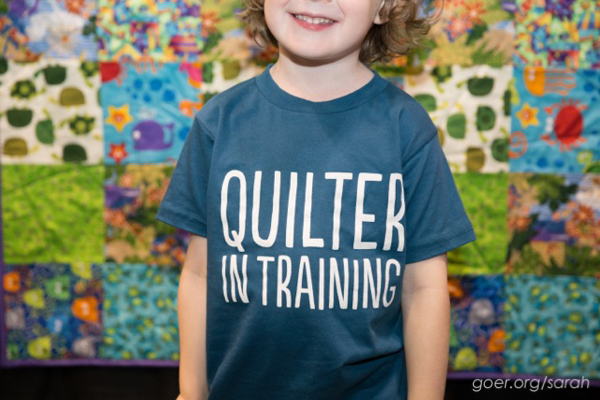 Tell your son he is now my new best quilting friend. I had a wonderful time interacting with him at the show. Both of your children are adorable!! Oh, thank you, Roberta! He'll be pleased to hear that. We all had such a great time. What a great job. Little by little I'm teaching my grandchildren to sew and quilt. What a life long skill. Thank you. I learned to sew as a child. It's a skill I sometimes take for granted, but I'm so glad I learned young! Me, too. Started in 4-H. Loved the interview!! The boy's finished quilt looks great!! Great job!! Great time to put the outline of his little hand on his first quilt he made himself!! Thanks, Bo! I love the hand! Absolutely adorable! You both did an amazing job. I bet you are glad he decided to keep it. What did he decide to do for his friend? Thank you. I am very glad to keep it in the house. He's so proud of himself. There isn't a new plan for the friend yet. 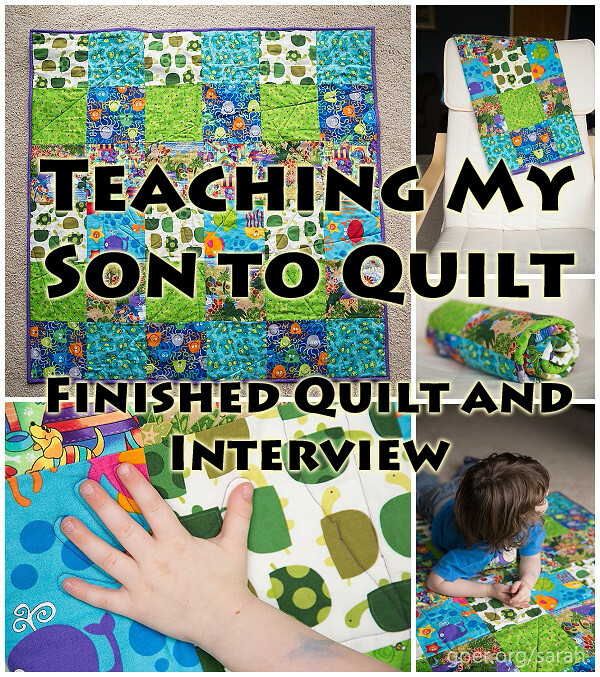 So much fun meeting your son and seeing the beginning of his quilting journey! Loved his quilt (and yours)! Thank you so much. You made his weekend very special, Sue. It was lovely to chat with you while we were there. Great job on not only making the quilt but for finishing it, sharing it with all of us, and for the awesome interview! So yeah, my life got better because of this quilt. So glad he's keeping his first project, not giving it to his friend after all. Good work mom too, for letting your son have this experience. It's a pretty cool thing!!! What a sweetheart! I loved the interview, thanks for including that. The handprint is a great idea. Wanted to tell you a quick story. I talked to a friend today that was lucky enough to meet your son at the quilt show. He took her to see his quilt and was explaining various parts of it when he pointed out his quilted hand print. After a little more discussion, he told her, "You can use that on your next quilt." And, she probably will! This is so cute. My own 4-year-old was looking over my shoulder and saw the picture of his hand in his quilted hand outline and now he wants to make his own quilt too. Of course, he's an artist and isn't happy with a simple patchwork, but he sketched a picture and we are making one block a day from it - yesterday we did a rectangle in a square and today we are doing a square in a rectangle. Tomorrow he wants a tent-shape (hopefully just a triangle, but we'll see). Thanks for the inspiration! Now that is one impressive project. I cannot believe your patience and his willingness to persevere. I will bet you made great memories together and there was some serious mom/son bonding going on. That's awesome - he did a great job and it's a lovely way to build memories. I think I probably started sewing around the same age and I still love it! CONGRATULATIONS!!! What a beautiful finish! Love the quilt. AND the interview was so much fun to read! Way to go, mom and son! Thanks, Lorna. The fabric for his second quilt is cut out, but since it's a doll quilt for his sister, it's presenting some problems about finding time to work on it when she's not around. Her birthday is in 3 1/2 weeks so it's getting to be crunch time. Thank you, Silvia. Glad you enjoyed. Thanks for visiting! I loved, loved, loved reading this series!! What a wonderful skill to share with your little son! 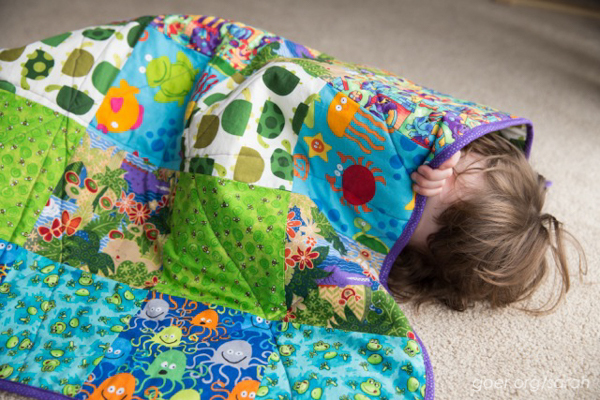 I would never have thought a child so young could use a sewing machine, much less create an entire quilt! How patient you are to take him through each step a little at a time, so that he didn't get frustrated. And his interview--I'm so impressed! 4 1/2? Really? What a talented, hard-working boy he is and what a wonderful Mom you are!! Thank you for the sweet message, Tammy. 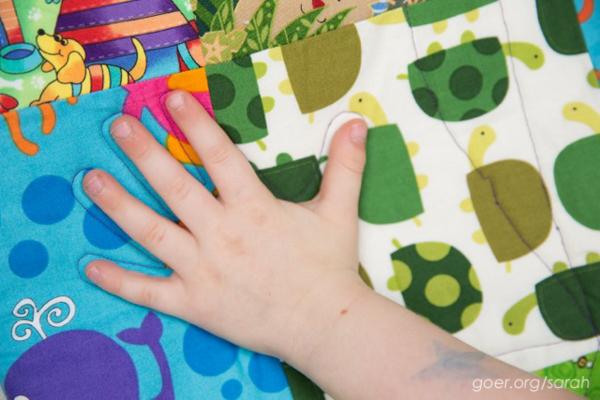 I'm so glad that I can share my passion for sewing and quilting with my kids.